Amalgamation, as its name suggests, is nothing but two companies becoming one. On the other hand, Absorption is the process in which the one dominant company takes control over the weaker company. These are two business strategies adopted by the companies to expand itself and take a competitive position in the market. But, here one should know that Amalgamation can occur in two ways i.e. in the form of merger or the form of absorption. Amalgamation is the legal process, in which two or more companies combine themselves to form a new company. On the other hand, absorption is when two or more companies are combined into an existing company. 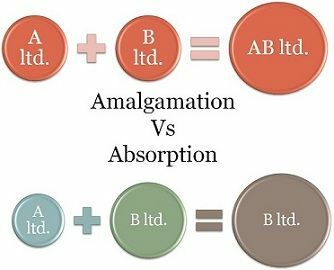 Here, we have compiled all the differences between amalgamation and absorption of companies, which you were looking for. Meaning The process in which two or more than companies are wound up to form a new company, which acquires their business is known as Amalgamation. The process in which one company takes over the other company is known as Absorption. Size of entities The entities are of the same size. The bigger the entity overpowers the smaller entity. Amalgamation is a process in which two companies liquidate to create a new company, which takes over the business of the liquidating companies. The transferor companies lose their identity to form a new company (transferee company). It includes absorption of one company by the other company. Accounting Standard – 14, issued by ICAI (Institute of Chartered Accountants of India) deals with Accounting for Amalgamation. Methods of accounting for amalgamation are Pooling of interest Method and Purchase Method. In this process, the companies which go into liquidation is known as Amalgamating Companies or Vendor Companies whereas the company which is newly formed is referred to as the Amalgamated Company or Vendee Company. Amalgamation in the nature of merger: Two company merges to form a new company. Amalgamation in the nature of purchase: One company purchases another company. The process in which one company acquires the business of another company is known as Absorption. In this process, a smaller existing company is overpowered by an existing larger company. No new company is established in absorption. There are two companies involved in this process, i.e. the company who takes over the business of the other company is known as Absorbing Company, and the company whose business is taken over is known as Absorbed Company. AS – 14, Accounting for Amalgamation, governs the absorption of companies. In this process, the weaker company looses its identity by merging itself with the stronger company. The transferee company exercises control over the transferor company. The two companies differ in their size, structure, financial condition and operations. The companies either mutually take the decision of absorption, or it can be a hostile takeover. The main reason behind absorption is gaining synergy, expansion, and instantaneous growth. When two companies join and liquidate to give birth to a new company is known as Amalgamation. Absorption is a process whereby one company occupies control over the other company. Amalgamation is voluntary in nature, whereas Absorption can be discretionary or hostile. In amalgamation, there are minimum three companies involved, i.e. two amalgamating companies and one new company which is formed by the fusion of the two companies. Conversely, in Absorption, only two companies are involved. In amalgamation, the formation of the new company is there while in absorption no such new company is formed. The size of the companies going through amalgamation is more or less the same. On the contrary, one company of bigger size overpowers the company of smaller size in Absorption. Amalgamation is a wider term than Absorption because the former includes the latter. In a nutshell, in Amalgamation, the two companies are liquidated to form a new company, but in Absorption, only the merged company goes into liquidation, but there is no formation of a new company. Here is an example which will clarify the difference, i.e. A Ltd. and B Ltd. joined to form AB Ltd., it is known as an amalgamation, whereas A Ltd takes over the business of B Ltd., so B Ltd. loses its existence, and only A Ltd. exists, it is known as absorption.